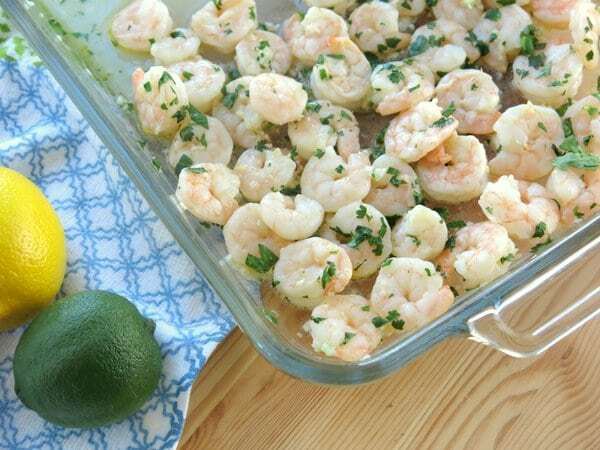 Roasted shrimp cooks quickly in a garlicky sauce with cilantro, lime and lemon. Spoon the extra sauce over rice or noodles and add a few veges for a high-protein, low calorie meal. 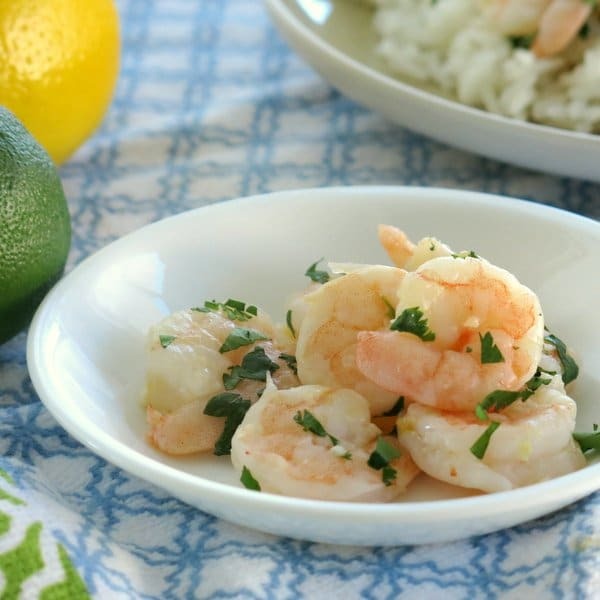 …this garlicky roasted shrimp was awesome! Sorry, to scream out like that. But, this is another one of those recipes that is sooo easy to make that it’s a must for your recipe rotation. The marinade is a simple mixture of butter (I use a low-fat, vegan version,) lemon and/or lime juice and garlic. Marinate the shrimp for about 15 minutes and bake for about 10. Sprinkle fresh cilantro all over when it comes out. It is a site to behold. I like to roast the shrimp in the oven rather than messing with the stove top. One pound of shrimp fits perfectly in my glass 9 x 13 inch pan. Check the shrimp after 10 minutes and give it a stir. The shrimp should be pink and no longer opaque. I’ve got my healthy on when I have this. I don’t worry too much about the butter. I don’t use much, most of it stays in the baking dish…if I want it to…and I use a low-fat margarine to keep the calories down. Shrimp is naturally low in calories, so I eat my fill. Ahem…I mean I am mindful of what I am eating and eat until I am comfortably satisfied. I usually mix in some veges and serve it over rice or noodles, preferably the whole wheat kind. I always feel indulgent without feeling like I over-indulged. 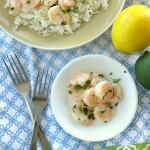 Add a few toothpicks and serve roasted shrimp as an appetizer too! 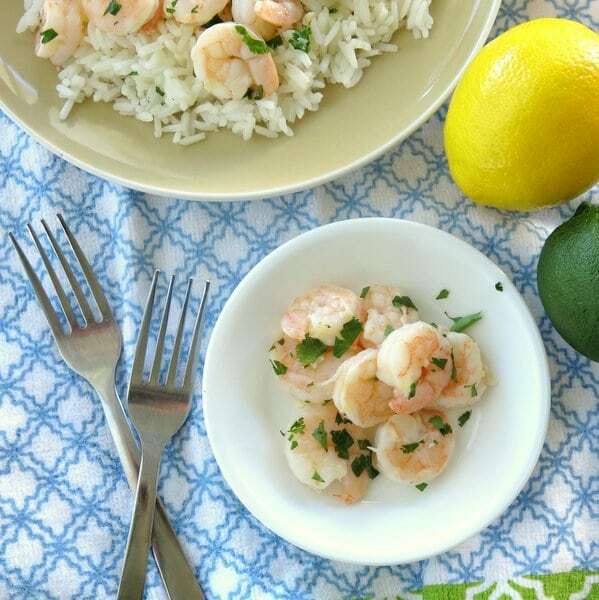 Roasted shrimp in a garlicky sauce with cilantro, lime and lemon cooks in just 10 minutes. Spoon the extra sauce over rice or pasta and add a few veges for a high-protein, low calorie meal. Place shrimp a large glass baking dish. 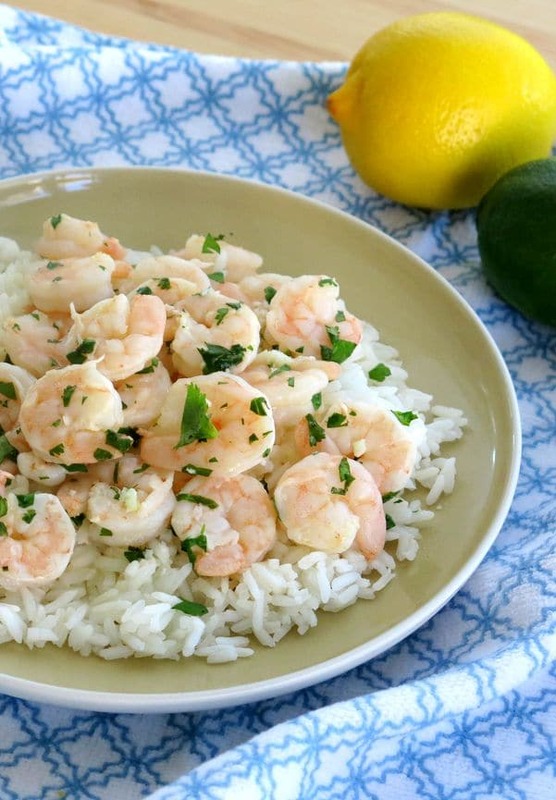 Mix butter, lemon/lime and garlic together and pour over shrimp. Toss to coat shrimp and then arrange shrimp in a single layer. Allow shrimp to marinate for 15 minutes, but no longer than 30 minutes. Bake shrimp for 10 minutes or until shrimp are pink and no longer opaque. Sprinkle fresh cilantro over the top of the shrimp. Serving suggestion: Serve over rice or pasta along with your favorite vegetables.Spoon excess sauce over the top, if desired. What a great, simple recipe, Marjory! If lemon and lime are good separately, they’ll be even better together. Especially with shrimp! Yum! Thanks for stopping by…I’m guessing you have a special spot for lemons though! Thanks Deb! Thanks for pinning. I love it when there are leftovers too…just had some for lunch! I’m so jealous of all of you people and your Meyer lemon trees. But so enjoy seeing all of your recipes. I think this sounds really good Marjory. Thanks Lea Ann! It’s a nice Florida perk!